Reviews of Takagi water heaters, including popular T-KJr2 and T-H3 models. Explore the most advanced Takagi tankless models with the condensing technology reaching high energy efficiency of over 95%. Check out the best models and features to look for. Flexible venting with indoor, outdoor and direct vent conversion kits, including concentric and dual-pipe systems, and horizontal and vertical termination. Multi-Unit and Easy-Link capability to connect two or more heaters and provide higher water flow rate, for high demanding applications. Electronic circuit board with the microprocessor for the enhanced safety and advanced monitoring, including diagnostics and error code notifications. Double flame sensors ensure greater safety. Clean gas combustion with the help of the air-fuel ratio rod and computerized operation for better performance and efficiency. Temperature controller that is integrated into some models and provided with others. Commercial grade materials for heavy-duty conditions and long-term use. Primary heat exchanger - some models are made of commercial-grade copper alloy HRS35 which gives more strength than the regular type (commonly used) copper. Secondary heat exchanger - made of 316L stainless steel - condensing models only (T-H3 and 540P models). Bypass and flow adjustment valve built-in in some of the commercial models that deal with the high hot water demand. Safety features that protect the units from freezing, extremely high temperatures and overheating. Great warranty of 15 years on the heat exchanger and 5 years on other parts. Takagi offers several models with the tankless technology, designed for residential and commercial applications, where the most advanced models include the condensing technology, resulting in the high energy efficiency of over 90%. For easier selection, we will group all the tankless models into three categories for use in small, medium and large size homes. In order to choose the right Takagi model, you have to know what size to look for. In order to properly size the heater, take into consideration the following factors; peak flow requirements, temperature rise (the difference between outgoing and incoming water temperature) and types of applications. In order to calculate the peak flow requirements, or how much hot water do you need at one time, use the chart below. See how many applications are to be used at the same time and add those numbers to calculate the total sum of the water flow. Example: If running three applications simultaneously: 2 showers and washing machine (2x2.5+2=7 GPM), the total flow rate is 7 GPM. To get enough hot water, choose a model from Takagi T-H3/540P series. Below is the table with the available Takagi models, water flow and number of fixtures it can supply, and for two regions – warmer with the temperature of the incoming water of 70 F and colder – with the temperature of water 50 F.
T-KJr2-IN and T-KJr2-OS models are non-condensing tankless water heaters that are recommended for homes with one to two bathrooms, also apartments, cottages and condos, and for indoor and outdoor installations. These models are designed as an efficient and cost-effective way of residential water heating and can be combined with the radiant floor or baseboard heating. With the appropriate venting kit, Takagi T-KJr2 can be converted into the direct vent model for use in confined areas. The temperature controllers are provided. Uses two-pipe vent system. Low NOx emission. TK-110C-NI is the non-condensing unit that is designed for indoor use only and it comes with the one-pipe concentric vent option. Small size, great for small houses and apartments. Ultra-low NOx model. The temperature controller is built-in. An indoor model TK-110U-I comes with an integrated temperature controller while it is provided for an outdoor model TK-110U-E. Small size, great for small houses and apartments. Ultra-low NOx gas emission. Non-condensing. 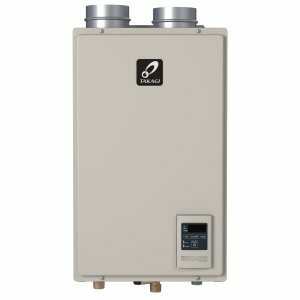 Takagi T-K4-IN and T-K4-OS are non-condensing, tankless water heaters designed as the indoor and outdoor models with the water flow capacity and energy efficiency sufficient for heating water in homes with up to 3 showers - working simultaneously. The remote control is not built-in but is provided, as the standard feature. The venting system of the indoor model uses the two-pipe system. Low NOx emission. TK-310C-NI is a non-condensing indoor unit that comes with the concentric venting system for easier installation. It meets the ultra-low gas emission requirements. It comes with the built-in temperature controller. The 310U series offers two models; an indoor TK-310U-I that uses the two-pipe venting system, and outdoor TK-310U-E model which is ventless. An indoor model comes with the integrated temperature controller, while it is provided with the outdoor unit. These are ultra-low NOx models. Takagi T-D2 water heaters are designed for residential and light commercial applications and for indoor and outdoor installation. Up to 4 heaters can be connected into one system, using the Easy-Link communication cable. They utilize the commercial-grade heat exchanger. Takagi TK-510C-NI comes with the concentric vent option making the installation much easier. It is available only as an indoor model. Due to its strong burner and commercial-grade heat exchanger, it is recommended for heavy hot water use. It meets ultra-low NOx requirements. The model can be used in homes and commercial application. Designed for residential water heating, combination space heating, and recirculation system. With the Easy-Link communication cable, up to 4 units can be connected, while with the Multi-Unit controller, up to 20 units. The temperature controller is built-in. 510U series comes with almost the same features as the above 510C series (including the Easy-Link and Multi-Unit systems), with the difference that its indoor model TK-510U-I uses the two-pipe system. There is also an outdoor type - TK-510U-E, designed for homeowners who prefer outside installation. Takagi water heater from H3M series has the lowest water flow rate, while the H3 model is the most powerful and has the highest hot water delivery rate. All the models from H3 series are Ultra-low models and Energy Star compliant. Indoor models come with the two-pipe vent system and integrated temperature controller while the outdoor models are ventless and come with the separate controller. Only the T-H3-DV-N and T-H3-OS-N use an Easy-Link or Multi-Unit controller to connect more units into one system and therefore provide more hot water. Check out the reviews and prices on Amazon.com. Takagi water heaters TK-540P-NIH and TK-540P-NEH are tankless and condensing water heaters that are able to provide instant hot water. How? The series integrates a recirculation pump and a dedicated recirculation line, and controlled with an integrated temperature and pump controller on the indoor model and on the provided controller of the outdoor unit. These units are also ultra-low NOx compliant and can use Easy-Link for more hot water delivery. Tankless water heaters, such as those from Takagi, do not store hot water as the conventional tank-type. Tankless models heat water on demand, when it is passing through one or two heat exchangers. Those models with two heat exchangers are called condensing. And they are the biggest energy savers. This is important because up to 25% of home’s annual energy use goes on water heating. Another great advantage, except on demand heating, is the unlimited supply of hot water. The advanced models are controlled by the built-in computer which allows better temperature control, accuracy, enhanced safety, convenience, and comfort. Also, reliable and durable operation. Takagi tankless are compact and lightweight that comes with the size of a small suitcase, allowing easy handling and installation. The wall mount, long vents, and flexibility in design ensures unit installation almost anywhere inside and outside the house. Takagi Industrial Co. is one of the four popular Japanese manufacturers of tankless water heaters sold in the US. The headquarters is in Japan, and Takagi has been designing and producing water heating appliances since 1952. According to the manufacturer, Takagi water heating products are the first units with continuous water supply and on-demand heating that entered the North American region. Also, Takagi is among the first ones who were able to offer a model, T-H1, with the ultra-high thermal efficiency of close to 95%. Takagi water heaters are, together with Rinnai, Noritz and Paloma, high quality and most advanced units from Japan, that offer green technology with the high-efficiency combustion and lower gas emission.